Description: In June of 2008, teams from diverse campuses across the country came together to explore and create programs aimed at enhancing the religious literacy of their students. 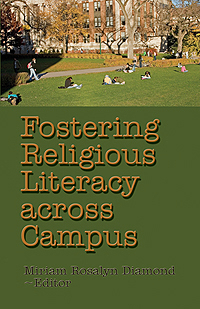 The Society for Values in Higher Education sponsored this Institute for Religion on Campus and Community, with funding from the Jesse Ball duPont foundation. This publication is a description of the diverse curricular and co-curricular projects developed at these institutions. America, and its colleges and universities, are engaged, if not embroiled, in debate over the nature of secularism, over-politicization, freedom of speech and learning. Following a number of conferences and grants, the authors have produced a book that addresses, in a most thoughtful and balanced manner, two major themes that can frame the discussion. Why should religious literacy be pursued in a college education? What are some of the specific campus initiatives among some of the most innovative (and varied) campus environments? I highly recommend this volume to educators, faculty, and advanced students interested in the future of liberal education and religious literacy over the next decades.